Hotel weddings in Daytona Beach are one of the many attractions for a Florida beach wedding in Daytona. Daytona Beach is one of the only places in Florida with an abundance of hotels DIRECTLY on the beach. Many hotels will claim to be on the beach, but will have a long walkway, or even a street blocking you! In Daytona Beach you have the option to have a wedding at your hotel that is directly on the ocean. Hotel Weddings in Daytona Beach- Are they right for you? Convenience– Hotel weddings in Daytona are the most convenient way to celebrate your Florida beach wedding ceremony. With a true one-stop-shop option, you can rest assured that your day will run smoothly. You can get ready at your hotel room, walk down to your Daytona Beach wedding ceremony and then head right back up to your hotel to enjoy your reception. Don’t stress over coordinating travel plans, including directions, and hoping your guests arrive on time. This is also a great backup option for rain! Affordable– Having a beach wedding ceremony in Daytona Beach at a hotel can be a huge saving for you. On top of the savings of having a destination beach wedding, you will find that choosing one of our Daytona Beach Wedding Packages will not only be cheaper than having a ceremony through your hotel, but will also give you beautiful decor. Some hotels charge more than our most expensive Daytona Beach wedding package, and give you nothing but a couple of chairs! Save money and get more with our beach wedding packages. 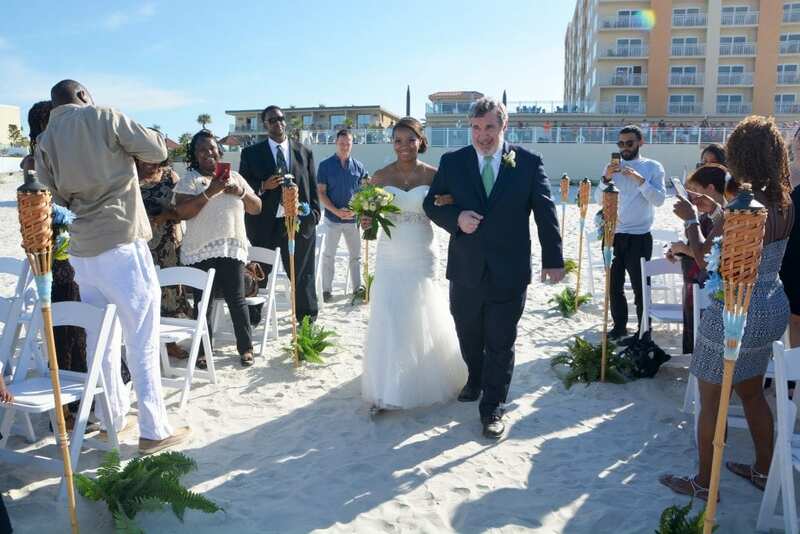 Crowds– While hotel weddings in Daytona Beach do take place in less secluded beaches, the guests are courteous and will be in awe of your beautiful Daytona Beach Wedding Ceremony. There is nothing quite like having the guests cheer for your from the distance of the pool deck as you officially start your new life together. Less stress– We do our best to make your Daytona beach wedding ceremony as stress free as possible. However, having one of our Hotel weddings in Daytona Beach can eliminate a whole other level of stress. Forget about coordinating transportation, providing directions, worrying about where to go on the beach, when you need to leave to arrive on time, traffic and so much more. Get an ocean view room and easily be able to see your Daytona beach wedding ceremony setup on the beach outside of your hotel, so you know exactly where we will be. Mini vacation– Many hotels around Florida will claim to be “on the beach”. However, with long walkways and sometimes even roads blocking you to the beach, you really aren’t truly oceanfront. There are a wide variety of hotels directly on the beach. This makes it easy for you and your guests to truly enjoy all the beach has to offer. With pool decks overlooking the ocean, and just a quick walk across the pool deck until your toes hit the sand, it is easy and convenient to soak up as much time on the beach as possible (but don’t forget your sunscreen!). Your guests, especially those with kids, will love the convenience and easy access of getting to the ocean. You and your guests can also kick back, have a meal or a drink on the pool deck and enjoy the cool ocean breeze, views of the ocean, and get a true feel for paradise. Check out our Daytona Beach Wedding Packages Here, or Contact Us to reserve your wedding date.